Massive open online courses (MOOCs) often are viewed as synonymous with innovation and openness. In this chapter, we trace their origins and varied manifestations and the ways they are understood. We interrogate the wide-ranging uses and interpretations of the terms massive, open and course, and how these terms are represented in different types of MOOCs. We then identify contradictions associated with MOOC excitement. Despite the initial agenda of MOOCs to open up access to education, it is seen that they tend to attract people with university education. Rather than offering scaffolds that support people who are not able to act as autonomous learners, MOOCs often are designed to be used by people who are already able to learn. Like traditional education systems, MOOCs usually require learners to conform to expected norms, rather than freeing learners to chart their own pathways. These norms sustain the traditional hierarchy between the expert teacher and novice learner (Ross et al. 2014). A particularly troubling feature of MOOCs is that, as supports are becoming automated and technology-based, this power structure is becoming less visible, since it is embedded within the algorithms and analytics that underpin MOOCs. Barro, R. J., & Lee, J. W. (2010). A new data set of educational attainment in the world. NBER working paper, 15902. Available from: http://www.barrolee.com/papers/Barro_Lee_Human_Capital_Update_2012April.pdf. Bates, T. (2014, October 19). The strengths and weaknesses of MOOCs: Part I [Web log comment]. Retrieved from http://www.tonybates.ca/2014/10/19/the-strengths-and-weaknesses-ofmoocs-part-i/. Caulfield, M., Collier, A., & Halawa, S. (2013, October 7). Rethinking online community in MOOCs used for blended learning. EDUCAUSE Review. Retrieved from http://www.educause.edu/ero/article/rethinking-online-community-moocs-used-blended-learning. Clark, D. (2013, April 16). MOOCs: Taxonomy of 8 types of MOOC. Retrieved from http://donaldclarkplanb.blogspot.co.nz/2013/04/moocs-taxonomy-of-8-types-of-mooc.html. Conole, G. (2013). MOOCs as disruptive technologies: Strategies for enhancing the learner experience and quality of MOOCs. RED—Revista de Educación a Distancia, 39. Available from: http://www.um.es/ead/red/39/conole.pdf. Dillenbourg, P., Fox, A., Kirchner, C., Mitchell, J., & Wirsing, M. (2013). Massive open online courses: Current state and perspectives. In Manifesto from Dagstuhl Perspectives Workshop. https://doi.org/10.4230/dagman.4.1.1. Hashmi, A. (2013). HarvardX set to launch second SPOC. Harvard Crimson. Available from: http://harvardx.harvard.edu/links/harvardx-set-launch-second-spoc-harvard-crimson-amna-h-hashmi-September-16-2013. Hickey, D. (2013). On MOOCs, BOOCs, and DOCCs: Innovation in open courses. 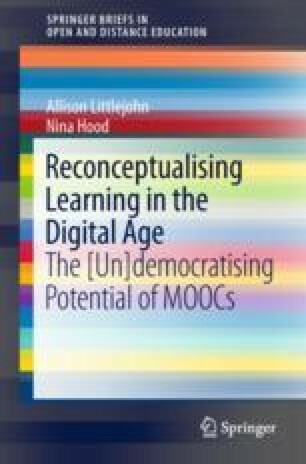 Available at: http://remediatingassessment.blogspot.co.nz/2013/09/on-moocs-boocs-and-docc-innovation-in.html. Holotescu, C., Grosseck, G., Cretu, V., & Naaji, A. (2014). Integrating MOOCs in blended courses. In Proceedings of the International Scientific Conference of eLearning and Software for Education, Bucharest (pp. 243–250). https://doi.org/10.12753/2066-026x-14-034. Jaschik, S. (2013). Feminists challenge Moocs with Docc. Times Higher Education. Available from: http://www.timeshighereducation.co.uk/news/feminists-challenge-moocs-with-docc/2006596.article. Lane, L. (2012). Three kinds of MOOCs. Lisa’s Online Teaching Blog. Available from: http://lisahistory.net/wordpress/2012/08/three-kinds-of-moocs/. McAuley, A., Stewart, B., Siemens, G., & Cormier, D. (2010). The MOOC model for digital practice. Available from: https://tinyurl.com/y8rfxzz9. OECD. (2007). Giving knowledge for free: The emergence of open educational resources. Retrieved from: http://www.oecd.org/document/41/0,3746,en_2649_35845581_38659497_1_1_1_1,00.html. Shah, D. (2014, October 15). How does Coursera make money. EdSurge. Available from: https://www.edsurge.com/news/2014-10-15-how-does-coursera-make-money. Tattersall, A. (2013) Gold rush or just fool’s gold—A quick look at the literature. ScHARR MOOC Diaries. Available from http://scharrmoocdiaries.blogspot.co.uk/2013/07/scharr-mooc-diaries-part-xvii-gold-rush.html.